August, 2018 | AllTech Services, Inc.
A leak is quite easily one of the biggest enemies to plumbing systems everywhere. But what makes a leak such a feared antagonist? Well, there are a number of factors at play here. First off, even those leaks you may consider “minor,” like dripping faucets, can waste gallons of water throughout the months. These small leaks trick you into thinking they aren’t a big deal, and then the cost of your water use starts to add up. Bigger leaks waste water too, of course, and can also do extensive damage to your property. These leaks can happen behind walls or even beneath your flooring. In fact, most leaks are hidden, so they can do a lot of damage before you even notice them. 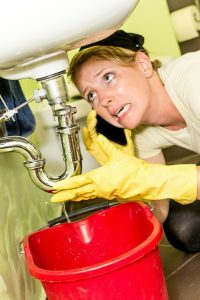 Since so much of your plumbing system is hidden from view, and since leaks can happen anywhere there is a pipe, it is essential you know how to spot trouble. Once you suspect a leak, you’ll want to get in touch with a professional plumber. But, how do you check?